Breathing under water is one of the rarest sensations that exist. But at the same time it is one of the most rewarding. The first few times is quite counter-intuitive. Your mind hallucinates to be doing something for which your body is not at all programmed. The only way to experience this feeling without great infrastructure and paraphernalia, is with an underwater breathing equipment like the one proposed by Scorkl. The Scorkl bottle, born as an authentic revolution in the world of diving, is a small, totally autonomous breathing device. It is a real alternative to the heavy equipment of the sports diver who does not want to descend to great depths. You do not need a heavy bottle, along with your regulator, vest, and so on. 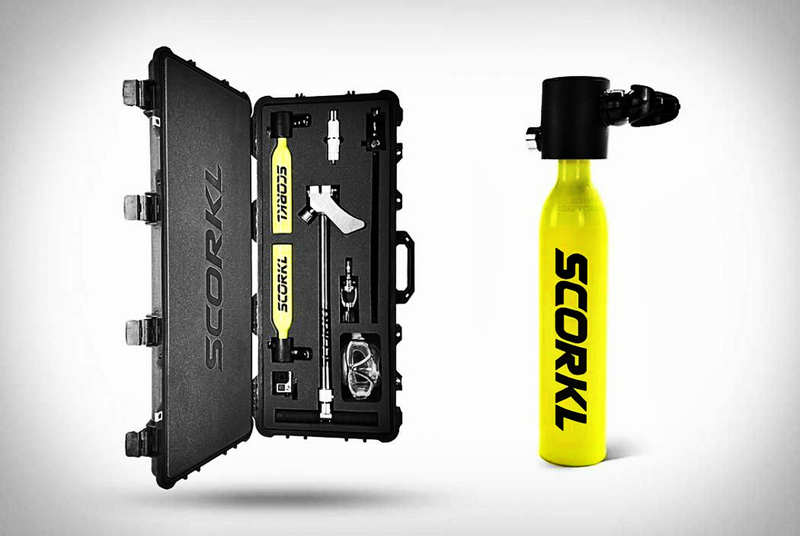 Scorkl guarantees breathing for about 10 minutes under water thanks to a mini-bottle of around one kilogram of weight. The bottle is connected to a mouthpiece, which acts as a mini-regulator, through which we can aspirate on demand about 60 puffs of air, which, as we have been saying, can represent around 10 minutes in depths of up to 10 meters. The more experience we have, the better our technique will be and the more relaxed we will be underwater, better accompanying our breathing and optimizing that estimated background time. Obviously, the main advantage of the Scorkl bottle is to allow snorkel trips with the added advantage of being able to submerge comfortably, without worrying about uncomfortable apneas. There will no longer be nooks and crannies that resist us; Wherever you put your eye, you can submerge without the inconvenience of running out of air immediately after arriving. Its weight and size content makes it not a problem to include it in our light equipment; It will fit perfectly in our mesh bag, along with our fins and mask. Its recharging system is tremendously simple; forget about air compressors; The Scorkl bottle includes a hand pump with which you can recharge in a very short time. Ideal for diving, recharging, and diving again. Anyone who uses this type of element to submerge several meters deep must know the compensation maneuver, or Valsalva maneuver. It consists of pinching the nose and blowing air in order to compensate for the air pressure in our nasal cavities. Knowing how to perform the maneuver correctly will save us a lot of suffering and pain, both at the time of the practice of diving, and subsequently. On the other hand, the inexperienced diver tends to perform apneas, that is, to keep the air in the lungs. Under water you should breathe continuously, and try to avoid this situation. Above all, special care must be taken at the time of promotion. If we breathe to a certain depth, we must bear in mind that we are breathing compressed air by the pressure of water on our heads. If we ascend by keeping that amount of air in our lungs, that air will tend to expand by reducing the pressure on it. Imagine that it is a balloon to which we do not stop blowing air. In the end, we all know how it will end. It must be avoided at all costs to ascend with the lungs driven by air. In summary, the Scorkl bottle is a really useful option if we want to complement our snorkeling equipment and start living the experience of breathing under the water; It will make the activity much more pleasant and comfortable, as long as we comply with a couple of basic safety recommendations.